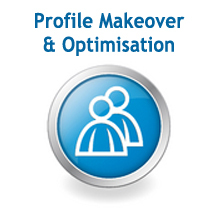 IS IT TIME FOR A MAKEOVER FOR YOUR LINKEDIN PROFILE? LinkedIn, since its 2003 inception, has been growing by leaps and bounds to become the platform for business networking. LinkedIn fact: As of March 31, 2012, LinkedIn operates the world’s largest professional network on the Internet with 161 million members in over 200 countries and territories. Ignoring LinkedIn can be a marketing mistake, as LinkedIn has categorically become the number one connection-based referral source for business professionals. 1. Ensure your profile includes an up-to-date photo of you in professional attire and fully coiffed, so that the image makes a stunning, professional first impression. It’s actually worthwhile to invest in a professional portrait. This is definitely the time and place to put your best face forward. 2. A vanity URL is always a good idea for your LinkedIn account – it sets you apart, is unique to you and if catchy enough, will be remembered readily by those who check your profile. It’s simple to change your URL. Just click on the Edit Public Profile settings at right, or simply edit next to the Public Profile in the blue profile box. 3. It’s imperative that your profile’s searchability be at its maximum potential. Your profile should be searchable on all search engines as well as on LinkedIn. A LinkedIn profile commonly ranks among the top five when a search is conducted on someone’s name. To ensure that your profile is public and to have it indexed, simply click on Settings, Public Profile and then select Full View Recommended. You can choose which items are viewable by others from the menu list. 4. Be sure to keep current with respect to your profile and status updates and make certain that any new posts or changes are sent to all of your connections. 5. Your summary is one of the most key elements of your LinkedIn profile. It’s important that it be well put together, succinct and that in its brevity, it does you justice. Ensure that it captures the essence of the ‘business you’ and that it specifically lets connections know exactly what it is that you can do for them. The idea here is to make people want to engage with you. Think personal branding – but remember, keep it brief! With over 100 million people connected on LinkedIn worldwide, it really is worth it to maximize your own profile to its full potential. Learn how to take complete advantage of everything LinkedIn and its unique features have to offer. Join one of our full-day, hands-on Social Media workshops. Simply click here http://onlineerealty.com/schedule.php for a schedule of workshops in your area and we’ll be happy to get you “LinkedIn”! This entry was posted in LinkedIn, Real Estate, Social Networking, Traffic. Bookmark the permalink.